One of the perks of living in Florida is fresh fish! 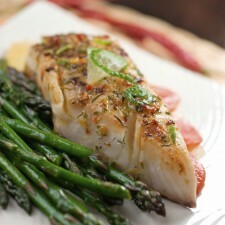 I love nothing more than coming home with fish we caught that day and making a fresh and healthy dinner. Pete came home on Friday with a ton of redfish from a work fishing trip, which we substituted for the tilapia (you can substitute any flaky, white fish and it will still be amazing). The next day I made blackened fish tacos for lunch. Wow! They were definitely better than any restaurant fish taco I’ve had. Keep an eye out for that recipe! Preheat large saute pan on med-high heat 2-3 minutes. Place 1 Tbsp Kelapo in pan, then add fish; cook 3 minutes. Add 1 Tbsp Kelapo to center of pan and flip fish. Cook 3 more minutes or until fish is golden and flakes easily. Transfer fish to serving plates. Add wine, 1 Tbsp Kelapo, 1 tsp flour, and lime juice to pan. Heat and stir 1-2 minutes or until thickened. Stir in parsley and serve sauce over fish. Serve with your favorite veggie to round out the meal.